Can the 'Alala return to the wild? 'Alala, also known as Hawaiian Crows (although they're more like ravens), were once common on the Big Island of Hawaii. But the birds suffered from persecution by humans, degraded habitat, and disease, and by 2002, no 'Alala were left in the wild. Today, captive breeding is under way in Hawaii, and 2011 was the best year ever for the program. The total 'Alala population now stands at 95 birds. While a previous attempt to return 'Alala to the wild came up short, we await the day when conditions are right to bring the sacred raven back to its forest. Learn more at ABCBirds.org. 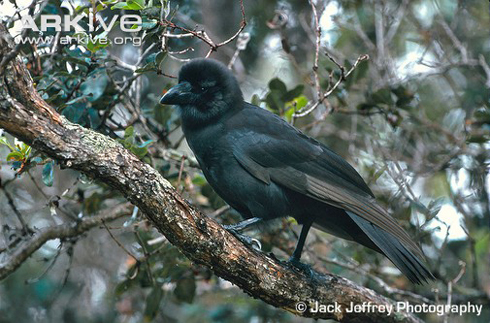 Hawaiian Crow - Can the ‘Alala Return to the Wild? Learn about the 'Alala at Audubon.org.